It’s been a few decades since I read George Orwell’s Animal Farm. Despite the passage of almost 75 years, the book’s satirical jab at communism/socialism remains a sad ‘description’ of 21st century life in the west. A quick recap for those who may not be familiar with Animal Farm: a group of animals take control of the farm they live on, kicking out the farmer. Life on the farm is good for a while, but trouble comes when the pigs fight for the hearts and minds of the farm animals. The top pig, Napoleon, seizes power and ends up exploiting the animals just like the farmer. In the end the pigs behave and even dress like the humans the animals kicked out. I’ve been mindful of the shift in the public consciousness for some time now. Of course it’s fair to say this is an ongoing process; no argument there. I feel the shift has been in a destructive direction I find most unsettling and concerning. Indeed, had I not personally lived through the last 50 years in New Zealand, I doubt I would’ve believed anyone who might regale me with the state of things today. In addition to the massive swing away from moral absolutes to the murky miasma of moral relativism, the politically correct nonsense many of us roll our eyes at is more than quaint silliness. No, the nonsense we see played out day after day on our TV screens, in the newspapers, online, over the radio, must surely have Mr. Orwell turning in his grave: I’m sure he would be disappointed that we neither heeded his ‘warnings’ nor learned anything from the failed communist/socialist systems he pilloried. To be fair, some things needed to change. Things like making sure women are given a fair shake of the stick are well overdue; or making sure we look after the environment; or nipping racism in the bud; or workers being paid fairly instead of being abused by powerful employers. But as with everything, we humans seem completely incapable of balance. We appear to have an almost insatiable desire to overcompensate for everything. Looking around New Zealand, it’s clear the result of meddling by the U.N. and their lapdog politicians in our social order has caused more problems than it’s solved. That, of course, is by design so the power of the state continues to expand and people become increasingly dependent on ‘the gummint’. It doesn’t take a rocket scientist to see the impact of things like Agenda 21 and the increasingly bloated bureaucratic ‘state within a state’ in our country; to recognize the Orwellian trends that have led to the massive reduction of real freedom, and the ‘gold cage’ imprisonment of an entire country. Of particular note are dramatic rises in ‘male shame’ and ‘white guilt’, the marginalization of those with traditional moral standards, the celebration of ever more strange and once-deviant behaviours and mindsets, the vilification of anyone who dares question the new status quo, and a whole new language of correctness that empowers every special interest group clamouring for their day in the sun. Adding insult to injury, anthropogenic ‘climate change’ has become gospel, the deniers of which are tarred with the same contemptuous brush as ‘flat Earthers’. Finally, a whole subset of New Zealand society has become ‘unacceptable’: namely, white, middle class males between 40 and 60 who still know the difference between right and wrong, and who have probably read Animal Farm. An area of great concern is the reverse racism that has engulfed New Zealand, and indeed the whole world. It goes beyond white guilt and shaming; it’s now ‘popular sport’ for anyone who isn’t ‘white’ to bitterly blast those of fair skin, because of course only ‘white’ people are evil: any non-white person is a ‘first country indigenous person’, blessed with purity of heart and freedom from all the corrupt, racist, superiority behaviours that plague the ever-shrinking ‘white societies’ around the world. The ‘b’ word (bigot) is trotted out so often these days, as soon as a ‘white person’ opens their mouth to point out that non-white people are still human and equally susceptible to every vice known to humanity, that no balanced discussion on the matter is even viable. And all the while, the local FCIPs in New Zealand (who of course we can’t point out WEREN’T first here at all) continue to cement their unelected power and control over our lives through stealth, nepotism, corruption, and a nice, big fat helping hand from the U.N. and ‘the gummint’. I will finish by highlighting a couple of Animal Farm’s ‘gems’. After the animals overthrow the people in the house, they establish ‘7 commandments’ to live by, two of which are ‘Four legs good, two legs bad’ and ‘All animals are equal’. By the end of the book, the commandments have mysteriously ‘morphed’ into ‘Four legs good, two legs better! 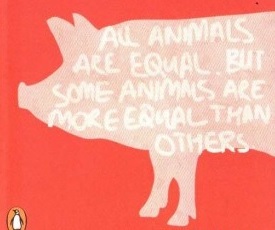 All Animals Are Equal. But Some Animals Are More Equal Than Others’. So here we are in New Zealand, living out the ‘Orwellian dream’. We’ve so over-corrected for past ‘evils’, so given our future and destiny into the hands of shifting, faceless bureaucrats, either at home or abroad, that we’re as much at the mercy of their whims and fancies as the animals who supported the pig’s rebellion in Mr. Orwell’s book. The questions facing us now, are: what can we do to re-balance the scales? Where do we start? Is it even possible to find a balance? I sadly suspect there are negative answers to these questions. Peter Lemon is a New Zealander with a passion for writing. Having lived in a number of other countries and witnessed the “rise and fall” of the west over a 50 year period, he is a firm supporter of limited government and personal responsibility. >"In addition to the massive swing away from moral absolutes to the murky miasma of moral relativism relativism..."
PC is actually the new absolutism - something is right or wrong for all time and in all contexts. Same as the old absolutism, only it's sociopolitical ideology rather than religious ideology that underpins it. All moral relativism really comes down to is contextualising ethical/moral judgments. I don't agree that PC is the new absolutism, as my observation is PC moves about to serve the interests of sector groups. Sector groups are devolving into smaller divisions demanding special treatment and PC language. Hopefully it will eventually devolve quickly back down to the individual where it used to be before the divisive pestilence of identity politics began. We dont even have a democratic say in who governs anymore. Just look at how we inherited the current lot! Very worrying. The Control/Left are not absolute in anything - other, that is, than their expressed aim of the destruction of nations and nationality and total control via the EU under latter-day-communism.